Live Lobster Surf And Turf Dinner! Home > Mother's Day Dinners! > Surf & Turf Dinners! > Live Lobster Surf & Turf Dinner! 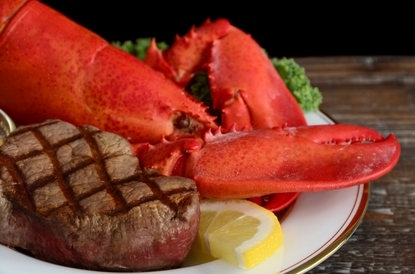 Live Lobster & Filet Dinner For Two! Two 1 1/2 Lb. Live Maine Lobsters, Two 8 oz. Filet Mignons comes complete With Two GREAT Seafood Appetizers, Clam Chowder And Crab Cakes plus Two complete Lobster Pick sets! All orders also come with a personalized hand written card with your message & Cooking Instructions for easy preparation! Two Live 1 1/2 pound Live Maine Lobsters, Two 8 oz. Filet Mignon, Two Crab Cakes Loaded With Sweet Maine Crab Meat And Two servings Of Our Award Winning Clam Chowder and pick sets! A Great Gift Idea For Holidays, Anniversaries, Birthdays, Or Just A Great Thank You Gift! Order Our Live Live Lobster Surf & Turf By 10am EST, And Enjoy It For Dinner Tomorrow! This Also Makes A Great Gift Idea For Your Favorite Seafood Lover! How Easy Is That! I have ordered this dinner for the past 2 years as a birthday gift for my son in law who lives in San Diego, CA. MY son in law loves lobster, my daughter doesn't eat it so this package is perfect. They both rave over the quality of the food and I am impressed with the ordering and follow through of the staff. I would highly recommend this company to my family and friends. What a phenomenal dinner! We received this as a present from my sister as a congratulations gift and we couldn't be happier with the meal! The chowder was creamy, the crab cakes were sweet and delicious, the lobster was perfect, and the steaks were wonderful and juicy! 100% recommend to anyone who wants to have or send a special and delicious meal. We ordered this for my wife's birthday. The lobster was great, and the filet we beyond excellent! I was hesitant to order beef from a lobster place, but it was better than the local steakhouses to be honest. We will order for the holidays. I want to thank you for the great meal we were sent by my cousin Martha. What a surprise, and the quality was outstanding, plus leftovers. Great products at a really great price! You guys came highly recommended! X-mas shopping already done! Nathan M.